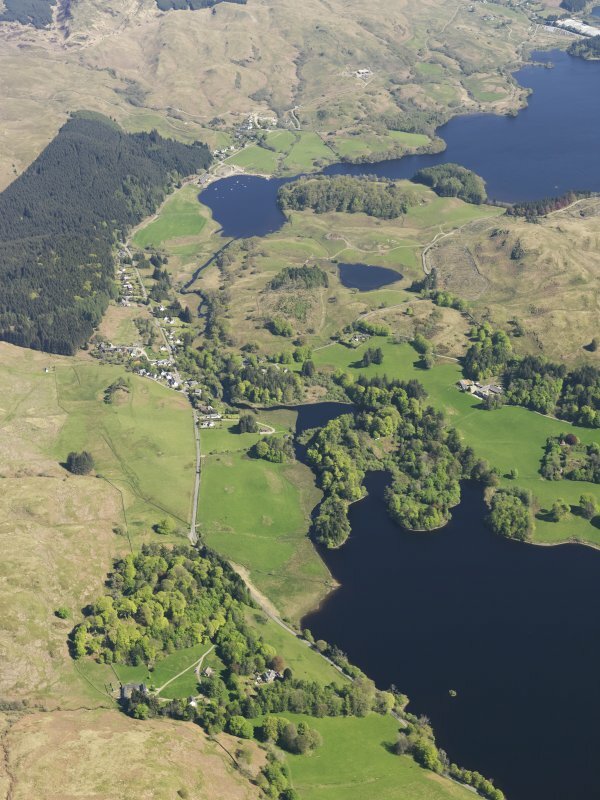 General oblique aerial view of Loch Ederline, taken from the S.
General oblique aerial view of Loch Ederline, taken from the SSW. 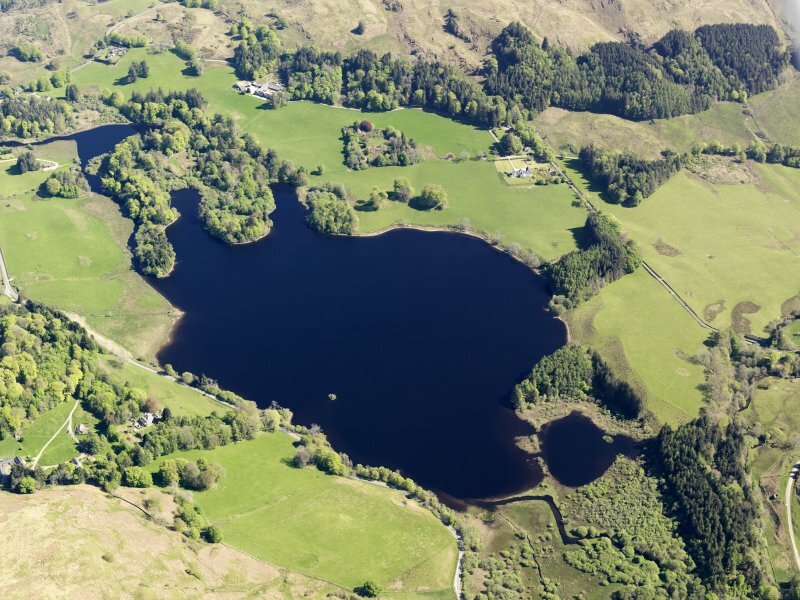 General oblique aerial view of Loch Ederline, taken from the SW.
General oblique aerial view of Ford with Loch Ederline adjacent, taken from the SW.
(NM 867 026).Crannog, Ederline Loch. There is a stony mound, with low bushes growing on it close to the W shore of Ederline Loch. It has a probable causeway, clear on air photographs, leading through the reeds between it and the bank. NM 8672 0253. This crannog measured 6m in diameter and 0.3m high (when the level of the loch was high). It is composed of small rounded stones, with no apparent structure, although below water level the stones do not seem to have been disarranged and are still well set. 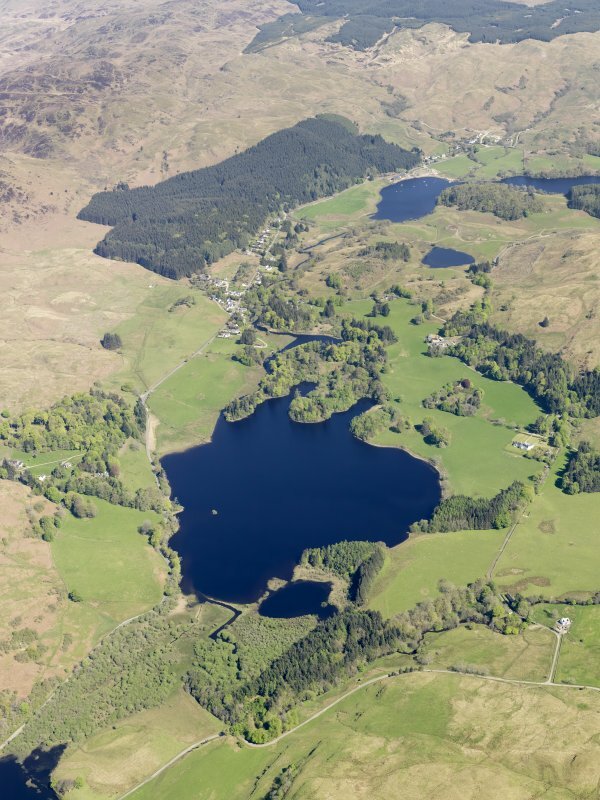 A causeway could not be confirmed, the average depth of water between crannog and shore being c. 2.0m. Visited by OS (D W R) 12 October 1971. Situated some 60m from the W shore, this crannog measures about 6m in diameter above present water-level and doubtless considerably more at its base; it is likely that there was a causeway between the crannog and the adjacent shore. NM 8672 0253 The crannog is visible above the water line as a tree-covered boulder mound, the dry area being c 7m in diameter at the time of survey (summer water level). Around 75% of the site is submerged. 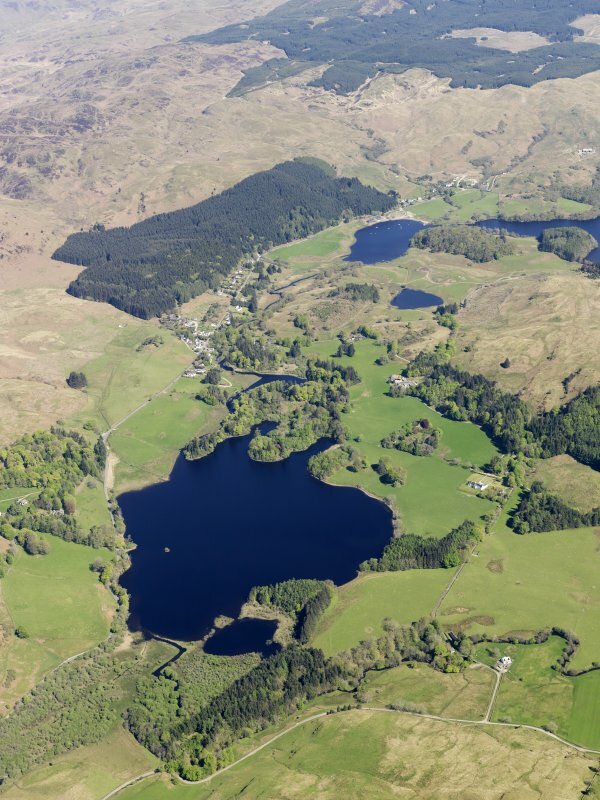 The diameter of the base of the stone mound is 17m, and the site is located 55m from the modern W shore of the loch. The site measures 1.5m high from base to tip. A small cairn construction on top of the mound is likely to be of modern origin. No piles were noted although two parallel horizontal timbers, probably alder, were seen protruding from the mound beneath the boulders and layer of silt approximately 25cm deep. These timbers are in a comparatively poor state of preservation, perhaps indicating that they have been exposed to air at some point in the past. No evidence of the construction of the causeway is visible, though it is possible that this is concealed beneath the silt. 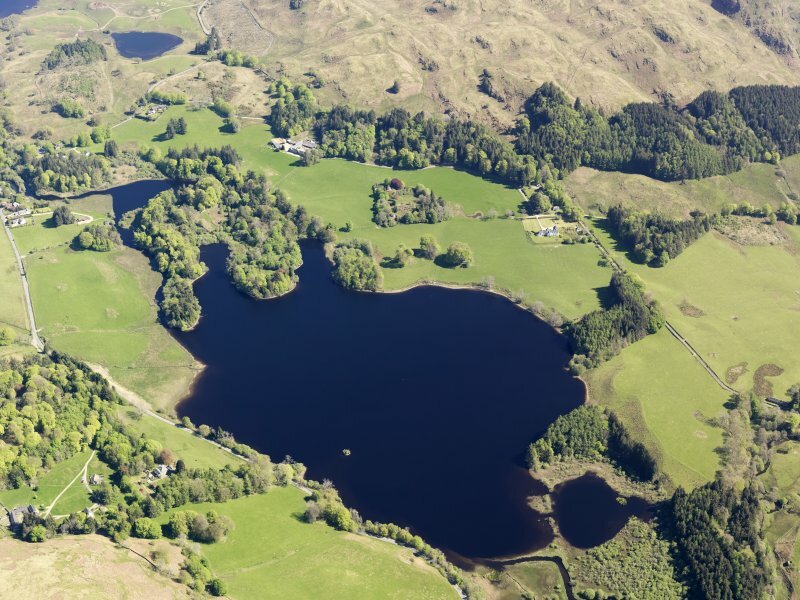 However, a raised area of the loch bed runs between the site and the W shore, and it is likely that this is the feature visible on aerial photographs.